Harrow Council provides a range of Commercial Services aimed at delivering trusted and competitive services. These services are available to all interested parties including Harrow's residents, businesses and schools. We are committed to putting the needs of the customer first and will seek to continually improve our services. 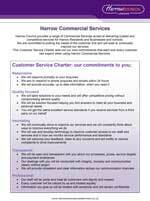 This Customer Service Charter sets out our core commitments that each and every customer can expect when using Harrow Commercial Services.